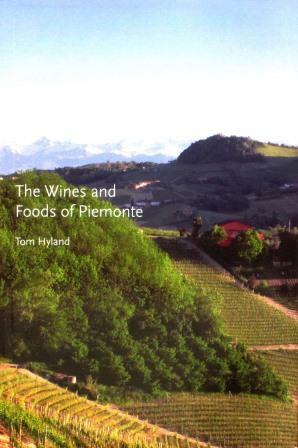 Back during the summer, my colleague and friend Tom Hyland published an important and useful new book, The Wines and Foods of Piemonte. It covers just about everything a wine lover could want to know about this blessed region, but of course – since the subject is the Piedmont – it gives pride of place to red wines. For that reason, I thought I’d wait to say anything about it until the weather cooled down, and an oenophile’s fancy lightly turns to vino rosso. Well, the moment has come: There is a nip in the air and an uptick in the appetite and a little more time being spent in the kitchen; some of the more organized among us are probably already thinking ahead to holiday feasts and even shopping for Christmas presents. When better to introduce you to a book that lays out all the palatal pleasures of the Piedmont? The Wines and Foods of Piemonte crams a huge amount of content into the space of a relatively small book. Its less-than-200 pages cover not just Barolo and Barbaresco, but the other Nebbiolo-based wines of the northern Piedmont, as well as the region’s other important red varieties, Barbera and Dolcetto, and even beyond them the less familiar but very, very interesting Ruché, Grignolino, Freisa, and – a particular favorite of mine – the delightful Pelaverga. And that’s just the reds: Hyland also treats sparkling wines, white wines, and sweet wines. Granted, Piedmont is not famous for its whites, but it does possess several very tasty indigenous varieties, to all of which Hyland does justice: Arneis, Gavi, Erbaluce di Caluso, Timorasso, Favorita, and Nascetta. These wines deserve to be better known, and some of them – I’m thinking particularly of Nascetta and Timorasso – are capable of great nuance (if that isn’t a contradiction in terms). The book provides useful lists of the best Barolo and Barbaresco crus and their producers, as well as recommendations for the best makers of other wines. It features very informative interviews with winemakers in all the Piedmont zones and also with some of the region’s most interesting chefs. In fact, for anyone planning travel in Piedmont, the book’s most useful feature may be its several-pages-long list of recommended restaurants – many of which I can personally and happily vouch for. Piedmont is a gustatory promised land, flowing with wine and truffles, and in Tom Hyland it has found an enthusiastic chronicler. 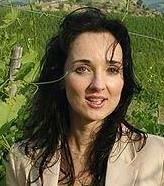 To order The Wines and Foods of Piemonte, contact the author at thomas2022@comcast.net. 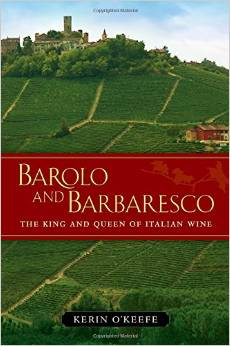 The University of California Press has just published Kerin O’Keefe’s Barolo and Barbaresco: The King and Queen of Italian Wines (346 pp, maps, photos, index: $39.95). I’ve been wanting to announce this ever since, over a year ago, I read the manuscript for the Press and enthusiastically recommended publication: To my mind, this is the most important book on these two great wines yet published. The depth of her knowledge of the Barolo and Barbaresco zones is unequalled by any other English-language journalist, and perhaps matched by only a small handful of native Italians. Despite the fact that I’ve been covering the great Nebbiolos for various publications for about 30 years (thoroughly, I thought), she has still managed to introduce me to some fine producers that I had simply never encountered. To put it briefly: The lady knows what she’s talking about. What she’s talking about is all of Barolo and Barbaresco, its history, its development, its soils and varieties and makers. Barolo and Barbaresco has more complete information – and very accurate, revisionist information it is – about the mid-19th century creation of a dry Nebbiolo wine than any other source. The presentation of the soil variations throughout the two zones is equally complete. What will probably be most pertinent for Nebbiolo aficionados, however, are her profiles of producers of both denominations. She does these village by village, detailing vineyards, field and cellar workings, house styles and their different bottlings. She doesn’t list every single producer, which would be almost impossible. But the wealth of information in her book is unmatched anywhere else – which is exactly why I was so enthusiastic in recommending it to the University of California Press. Now that it has been published, all I can add is this: If you love Barolo and Barbaresco, this book is indispensible. And now for something completely – well, slightly – different. Ceretto is one of the great Nebbiolo houses, and I have long admired its wines. Originally classic Piedmontese producers who bought grapes from all over both zones to make traditional Barolo and Barbaresco, brothers Bruno and Marcello Ceretto gradually acquired top-flight vineyards in some of the best crus of both appellations and used them to make some superb wines, in both the traditional mixed-communes style and in single-cru bottlings. Since roughly the turn of the century, Bruno and Marcello have turned the operation over to their children, and initially at least the results were not, for my palate, completely happy. It was an almost stereotypical story in Alba: The younger generation turned to using a forest of new French oak (just how many oak trees, one wonders, does France have left?) to make their wines modern and stylish (and different from their parents’?) and for my palate not really either enjoyable or true to the region. Then came vintage 2008. I will quote O’Keefe here, because we are in total agreement: “I was surprised by the graceful, pure Nebbiolo aromas and elegance of the firm’s 2008 Barbaresco Asij.” She goes on to explain this wine’s “graceful style, unfettered by obvious oak” as due to winemaker Alessandro Ceretto’s decision to turn away from new oak “to make wines,” she quotes him as saying, “that express terroir, that taste like they could only be from here.” For me, this is wonderful news: it’s great to have an estimable house like Ceretto rediscovering the true distinction of its region. I also had one other reassurance about Ceretto recently. I had been tasting a lot of old Barolo over the past year, and I’d had a few bottles of Ceretto that troubled me. They weren’t bad – far from it – but they tasted older than they should have, a little tired and fading when I thought that, given the fine vintages they were from, they should have been a lot more vigorous. 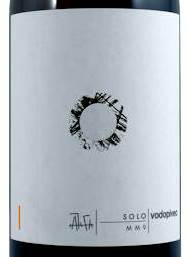 I know that with older wines, bottle variation is inescapable, but even so, they worried me. My reassurance came a few weeks ago from a very unlikely source – a bottle of Ceretto’s Barolo Brunate, a lovely cru but a very unpromising vintage: 1993. O’Keefe rates 1993 as two stars (out of five) and describes it as “a middling and variable vintage . . . to drink early while waiting for the 1989s and 1990s to come round.” I remember the vintage as pretty much below average across the board. So my expectations were low when I discovered that I’d somehow stored away a bottle of ’93 – maybe by accident, maybe with some thought of discovering just how well off-year Barolo could age. Well, if I had been disappointed by bottle variation with those other older Ceretto wines, in this case it seemed to work to my advantage. 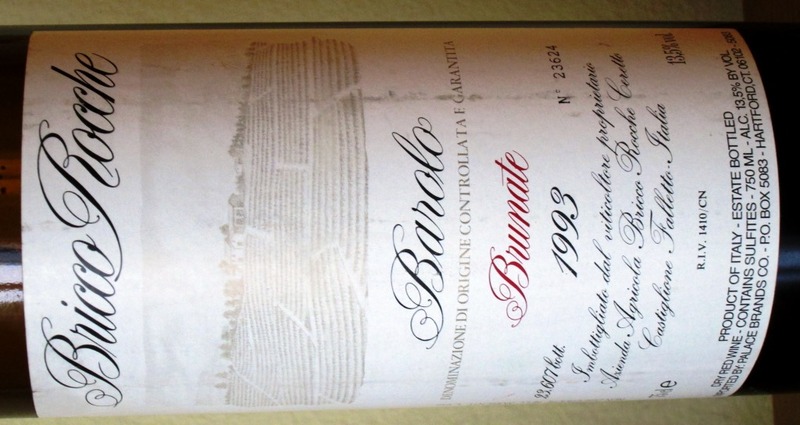 Either that, or the Cerettos really made a silk purse out of a sow’s ear with the 1993 vintage, because my now 21-year-old bottle of Brunate was just lovely. Light-bodied for a Barolo, to be sure, and I’d never call it vigorous – but elegant it certainly was, and smelling and tasting classically if lightly of the truffle, tar, and dried roses for which the Nebbiolo of the Alba area is renowned. 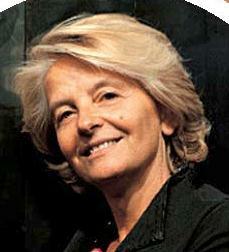 Diane and I enjoyed it thoroughly, and gave mental tribute to the good work of Marcello and Bruno. Two recently published books deserve every wine lover’s attention. Beyond Barolo and Brunello: Italy’s Most Distinctive Wines, by Tom Hyland, and The World of Sicilian Wine, by Bill Nesto, MW, and Frances Di Savino, take very different approaches to their subjects, but both offer abundant and valuable information for anyone curious beyond the most obvious level of Italian wine lore. Tom Hyland is a Chicago-based freelance wine writer and photographer who fell in love with Italy, its people, and its wines more than a dozen years ago and has been immersing himself in them ever since. His Beyond Barolo and Brunello organizes itself in what seems a familiar pattern, but then quickly moves off in unexpected directions. It treats all of Italy’s regions, north to south and the islands, an arrangement that will be familiar to anyone who has done a little reading in Italian wine – or in Italian travel, for that matter. But within each section, Hyland’s treatment is very different from the conventional. He begins each regional section with a simple listing of the most important grape varieties grown there, and then presents cameos of his favorite producers of each variety. This means that each chapter offers a survey of some of the best producers of each region in particular relation to what Hyland considers their best wines. For most readers, this will create some comforting recognitions, and a few surprises. For example: Massolino’s Barolo Vigna Rionda Riserva is an expected and appropriate entry – it’s a famous wine, after all – but how delightful it is to find entries as well for less familiar appellations and makers, such as the Boca from Le Piane, or Sella’s Lessona “Omaggio a Quintino Sella” from Piemonte’s northern wine zone. Similarly, in his treatment of Campania, all the famous varieties – Aglianico, Greco, Fiano – and all their famous makers – Mastroberardino, Terredora, Feudi di San Gregorio and so on – are handled thoroughly, but there is also respectful treatment of lesser-known varieties (the whites Falanghina, Coda di Volpe, Asprinio, Fenile, Ginestra, and Biancolella; the reds Piedirosso, Tintore, and even Merlot) and their producers. So Pietracupa’s and Ciro Picariello’s Fianos are presented right alongside their more famous compatriots. In the same way among the red wines, along with the famous Taurasis and Aglianicos, you find such fine small producers as Monte di Grazia, whose Costa d’Amalfi Rosso harbors the rare Tintore grape. For the wine lover who wants to explore the spacious world of Italian wine, Beyond Barolo and Brunello opens a very wide door to a treasurehouse of wines and their producers. The Nesto/Di Savino book, The World of Sicilian Wine, approaches its more traditional subject in a more traditional way, starting with several quite interesting chapters about the long – and for its protagonists, too often frustrating – history of winemaking in Sicily, a process too often directed more by external events and foreign interests than by Sicilians themselves. There follow equally interesting sections on the geography, geology, and climate(s) of Sicily and how all of these affect winemaking. Three large chapters deal in detail with the contemporary wine situation in Sicily’s three main geographical sections, the Val di Mazara, Val di Noto, and Val Demone. All three chapters feature interviews, long and short, with producers, great and small, yielding a fascinating overview of the important trends in Sicilian wine right now, as well as informative perspectives on some of the principal players. This clearly a heartfelt book: The authors’ affection for Sicily and its people – especially its devoted wine people – shines through everywhere, though it never gets in the way of their clear-eyed view of Sicilian winemaking’s possibilities and pitfalls. Of course in a book that covers as much ground as this one does, there are bound to be areas where my opinion differs from the authors’ – for example, I’m much more enthusiastic about the Carricante variety and the Etna wines made from it than they seem to be. But that’s a minor point: The key thing to remember is that this is a very carefully done, thoroughly researched production, packed with information and detail that will be very hard to find anywhere else. If you want to know about Sicilian wine, this is your book. That kind of leg work produces the detailed and accurate information that makes O’Keefe’s book a milestone in our grasp of Brunello. I know first-hand the kind of terrier-like persistence it takes to extract that information from even the most candid winemakers. Most are not trying to hide anything: they just don’t at first understand what you’re after. The majority of the wine journalists they encounter have about three questions: what grape (s) is it made from? Is it a good vintage? What does it cost? Back to O’Keefe’s research: The tough first step is getting the producers’ attention – making them aware you are serious and really want to know about why they chose to use botti rather than barriques and how that affects their wines, or why they adopted or gave up on organic cultivation, and what exactly it is about their clones or soils or exposures that distinguishes their wines. Most wine producers have been conditioned to talk about what they think the press wants to hear, and it takes intelligence and persistence and evident sincerity – the quality Italians mean by calling someone simpatico – to break through that to the deep well of knowledge that the best producers possess, and which they willingly share once they understand your seriousness, your willingness to work as hard at your craft as they do at theirs. Brunello di Montalcino has successfully tapped that well. The discussion of Brunello’s astonishingly short (by Italian standards) history is very complete, and its consideration of wine-making styles very thorough, as are all the portraits and evaluations of individual producers. 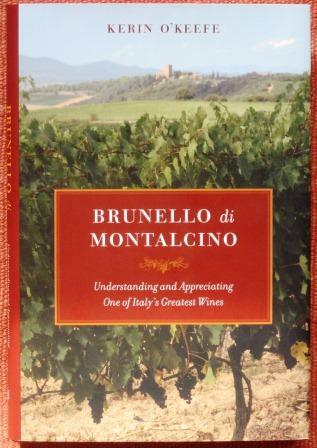 But the book’s greatest single contribution is almost certainly its detailed presentation of the variety of the Brunello zone’s soil types and the subsequent case O’Keefe makes for the necessity of some kind of subzoning of the territory. This is bound to be controversial: nothing more upsets winemakers anywhere than the thought that someone might entertain the remotest possibility that their vineyards are not the heart of the heart of whatever wine zone they’re in. 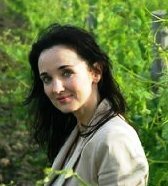 But for consumers, her breakdown of the areas with soils favorable to great Sangiovese production and those with less likely terroirs, and her later discussion of individual producers within those areas, will be invaluable. It’s not an infallible guide – high achievers in less fine areas can often make first-rate wines, while underachievers in great areas can always produce plonk – but it is an extremely helpful and illuminating one, the best tool I know for sorting out the great diversity of Brunello styles and qualities on the market. Needless to say, I don’t agree with everything O’Keefe says about individual estates. A few she has, for my palate, been too kind to, and a few too strict with. I think, for instance, she is unduly harsh on Banfi and mis-estimates its wines – but these are minor problems in what is overall an excellent book. Full disclosure: I’ve known Kerin O’Keefe for a few years now as a colleague and friend. I was one of the readers for the University of California Press who recommended publication of her book. For both those reasons I’ve hung back from reviewing the book here (it appeared in February). But I urged UC Press to publish Brunello di Montalcino because I thought it was a good book, not because I knew Kerin – and if I think it a good book, why shouldn’t I call it to my readers’ attention? Conscience eased, problem solved: ergo this review. I just received a copy of a new book by an old friend, Teresa Severini Zaganelli. Grapes in the Glass is a wine primer intended for teenage readers. I can already hear neo-Prohibitionists shrieking in chorus from coast to coast. But relax – the subtitle is “Wine: Know-how, Fun and Responsibility,” and it’s a very common-sense introduction to the world of wine not as exotica or narcotica but as a simple part of everyday life, maybe even as a career path. Teresa, a trained enologist in her own right, is the stepdaughter of the near-legendary Giorgio Lungarotti, the father of serious winemaking in Umbria. So she quite literally learned everything there is to know about winemaking at the feet of a master, and one who was around every day. She is also the mother of three, so she can be considered a master of that trade too. Which will lead me – eventually: I like to work up to things logically – to what surprised and pleased me most about her book. What isn’t at all surprising is how good a wine primer it is. Its discussions of the progress of wine from vine in the field to juices in the cellar to nectar in the bottle is detailed, clear, and complete. 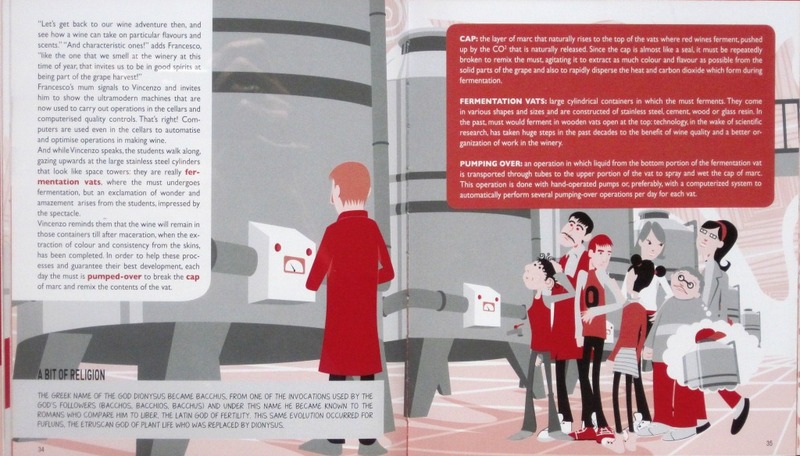 Anything you want to know about the winemaking process is in there, in a very user-friendly fashion, in clear, direct language, and illustrated by many amusing drawings. The framework of Teresa’s book – maybe fictional, maybe factual – is that her teenage son Francesco has volunteered his mother and her workplace for a class outing. What will surprise many Americans and outrage some is that the teacher and school OK the project, and Francesco and his peers visit Cantina Lungarotti for a lesson in viticulture and viniculture, conducted by Teresa. The presentation is straightforward and light-handed but never condescending. The information conveyed – and there is a lot of it – is presented clearly, in language scaled to an intelligent beginner’s comprehension. And it isn’t just about Italian wine; almost all of the book’s explanations apply equally to winemaking anywhere in the world. There’s a lot of wine lore in Grapes in a Glass that many serious wine fans will be happy to have in so concise and clear a form. Their teenagers may well have to wait until Mom and Dad have finished reading Grapes in a Glass before they get their chance at it. Which brings me to what really surprised me about this little book: its level of literacy, and the corresponding level of comprehension, it presumes in its intended teenage audience. As I said, Teresa is raising three children, and the frame narrative of her book sounds very much as if it is based on an actual occurrence. Anyone who has visited tourist sites in Italy knows that Italian children seem to be always trotting about on one field trip or another – so that aspect of the book is completely plausible. And if Teresa is right about the reading skills and attention levels of the young people she’s aiming her book at – and I have to presume she knows ragazzi as well as she knows vino – then that is plausible too. And that means that Italian teenagers are simply far better readers and much more serious-minded than their American coevals. I remember with great pain that I’ve taught many college students who didn’t have the reading skills or attention span that this short book presumes. That’s sad. It makes no difference whether students are reading Marx or the Bible, wine lore or the Rapture, if they can’t understand what the words mean. It’s bracing and encouraging to me to see evidence of a school system that is working. All we ever seem to hear about Italian education in this country is about student unrest and the crisis of the Italian universities. On the evidence of this splendid little tome, Italian schools are definitely doing something – maybe many things – right. Grapes in the Glass was originally published in Italian and has been very well translated into English, in a British idiom, by Valeria Cazzola. It’s odd, therefore, that Amazon UK sells only the Italian-language version. Amazon US doesn’t (at the time of this writing) carry the book at all, but the English-language version is available from FdF Marketing PR Consultancy for $14.99. E-mail defalco94@aol.com. Grapes in the Glass. 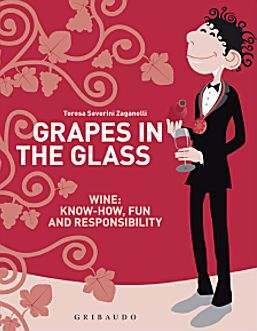 Wine: Know-how, Fun and Responsibility (Edizione Gribaudo, Milano, 2011), 72 pp., many illustrations, useful index. Readers of this blog know I contribute frequently to Decanter, a magazine for which I have a lot of respect. This doesn’t mean I agree with every opinion expressed in it, however, and I was particularly troubled to see James Suckling, for whose opinions I have very little respect, featured prominently in the current edition (Decanter, May 2011). The Suckling’s article strikes me as a textbook example of the worst kind of wine writing. It’s an opinion piece (rightly so-called because there is hardly a useful or accurate fact in it) about whether the so-called “SuperTuscans” are a fading star. 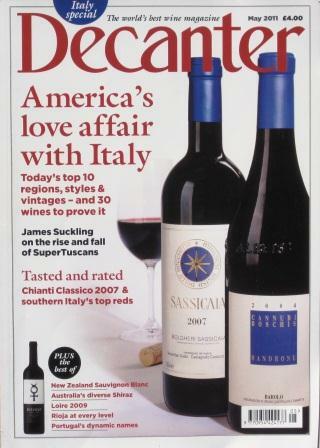 The cover promises more: “James Suckling on the Rise and Fall of SuperTuscans,” it says, but that isn’t what the Suckling delivers. Strange, because this is an issue on which consumers and producers have already voted with their dollars and their efforts. Since almost all SuperTuscans are now covered either by the IGT category or the many Tuscan DOC and DOCG designations, many producers have moved their formerly maverick wines into the more spacious conventional categories. And from everything I’ve been able to gather from importers and retailers, with the exception of the greatest stars of the SuperTuscan cast, sales of the whole category have been declining steadily in favor of classifications like Chianti Classico and Brunello. But this article is a typical Suckling performance. Let me walk you through it. Step 1: Immediately remind your readers how important you are: “People ask me if I invented the term SuperTuscan.” Gracefully concede that you didn’t, and you don’t know who did. Also admit that you don’t know whether these wines have “as much resonance with consumers” as they used to. So much for the “fading star” question, ostensibly the point of the article. Don’t trouble yourself to look up any production, sales, or distribution figures that might suggest an answer. That’s not your style. Step 2: Provide an extensive quote from one of your winemaking friends who is, incidentally, a participant in your upcoming, for-profit event, Divino Tuscany (see below for the skinny on this). Don’t worry that the quotation has nothing to do with the subject of your article: the point is publicity, not relevance. Thus, Lamberto Frescobaldi opines that people “may not have a clear understanding” of the term SuperTuscan, goes on about how they don’t know what a Chianti or a Brunello is either, and concludes that prices for these various wines vary. Now, as author, don’t use that as an opportunity to explain to your readers what a SuperTuscan is or how it may differ from a Chianti or a Brunello; that would just be information, and too boring. Step 3: Do talk a bit about the DOC and DOCG wine appellations, which allows you to mention your favorite wines in those categories – none of which costs less than $100 a bottle, which seems to be the lower limit of the Suckling’s interest in wine. Then admiringly recount the stories of two of the most prestigious (and expensive) SuperTuscans, Tignanello and Sassicaia. Step 5: Conclude your article by letting your buddy do the heavy lifting of pointing out how stupid all other wine writers are. Signor Sanjust does that nicely for the Suckling. He starts sensibly enough by observing that “we can’t become Burgundy or some other region like that.” But then he denounces “all those idiot wine critics and bloggers” who say that Italians should stick with native Italian varieties. “They don’t understand that there are microclimates and soils that are perfect for other grapes, and that they make great wines.” Final word, right? Says everything there is to say on the subject? Well, no; I think that those idiot wine critics and bloggers know perfectly well about the diversity of Italy’s terroirs, and they have serious reservations about the greatness of the wines in question. Does the world truly need another $100 Tuscan Merlot? I have problems with brand-new estates in California offering their first vintage at more than $100 a bottle, and by the same token I have doubts when Signor Sanjust tells me “we are simply trying to give the maximum pleasure to wine drinkers.” If he really means that, let him lower his price to around $25 – and then we can talk. Almost all the wines the Suckling mentions in this article, and the only two individuals he quotes, are sponsors/participants in Divino Tuscany, a barbarously named four-day event the Suckling is presenting in Florence in June – featuring “the best wineries in the region – all personally selected by me.” He is charging consumers €1,600 for the event, and that doesn’t include travel or lodging. This is clearly not a penny-ante matter. For him to be writing now about only participating wineries, and in particular, giving such inordinate space to self-serving personal promotion by Luca Sanjust, seems a blatant conflict of interest. This isn’t wine journalism: this is public relations. Those are two different activities and should be carried out by different people. The ethics of the wine business can often be murky, but journalistic ethics are pretty clear-cut: you’re not supposed to have any pecuniary relationship with individuals or firms about which you’re ostensibly objectively reporting. It’s not so long ago that journalists were released from magazines and newspapers for considerably slighter involvements than the Suckling’s with the people he writes of. 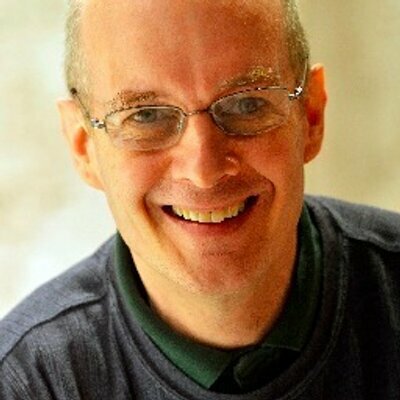 Persistent rumors in Italy – admittedly unverifiable: nobody is talking for attribution – claim that the Suckling is charging wineries heavily to be represented in Divino Tuscany. One figure I have heard is €10,000 per winery. Should these rumors turn out to be true, would this be the same as what the pop music industry used to call payola, and what politicians now know as “pay to play?” You tell me. Even if untrue, it still seems to me a glaring breach of journalistic ethics to write a purportedly unbiased article that hardly mentions a single wine that isn’t a part of your own clearly for-profit venture. That isn’t journalism: it’s advertising. Normally, whenever I read something with a title like “The Finest Wines of Lower Zanzibar,” my reaction is on the order of Sez who? and my subsequent reading is heavily charged with skepticism, if not outright disbelief. Most such screeds issue from the fertile brains of the Lower Zanzibar Chamber of Commerce or a similarly disinterested party and contain about as much genuine evaluation as they do useful information, quantities in both cases approaching absolute zero. That’s normally – but there are exceptions, and one exemplary one is a book with the breath-consuming title The Finest Wines of Tuscany and Central Italy: A Regional and Village Guide to the Best Wines and Their Producers. This is probably not a book for the casual wine drinker – there is too much information, of too specific a nature for that – but for the wino who already loves Tuscany or who is embarking on that romance, The Finest Wines of Tuscany is more than useful: It’s close to indispensable. Several elements of the book make it exceptional, despite its suspicion-rousing title (more about this later on). First, it’s written by Nicolas Belfrage, which automatically goes a long way toward building my confidence. Full disclosure: I know Nick Belfrage in a professional, collegial capacity. We encounter each other several times a year at tastings and such, exchange opinions, socialize briefly. I like him and respect his knowledge. I liked him and respected his knowledge years before I ever met him: Belfrage has been one of the pioneers of Italian wine journalism, from even before his 1985 publication of Life Beyond Lambrusco. I suspect that, over the years, he has put up with more than his share of condescension from some of his British colleagues because of his early championing of the cause of quality Italian wines. (Believe me, gentle readers, there are still a fair number of British connoisseurs – and a few North American as well – who refuse to accept that the words “quality” and “Italian wines” can occur in the same sentence.) Belfrage has persisted, and his beliefs have prevailed. The excellence of Tuscany in particular (much more so than Piedmont for the British palate and market) is now a widely if not universally acknowledged truth. Few people know the wines of Tuscany better than Belfrage. 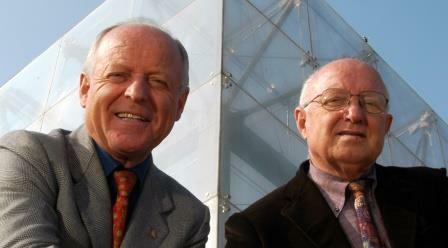 He has been professionally involved with them for decades, both as a journalist and as a member of the wine trade. In the US, that usually raises eyebrows and immediate questions of conflict of interest; in the UK, it is a commonplace situation and nobody takes notice of it. In the days before organized press tastings, there was no better way to learn wine and to taste a lot of it than by joining the trade. For years now, Belfrage has lived most of the year in Tuscany – not, if I remember correctly, in the conventional Chiantishire, but in that remoter, wilder northeastern corner called Rufina. 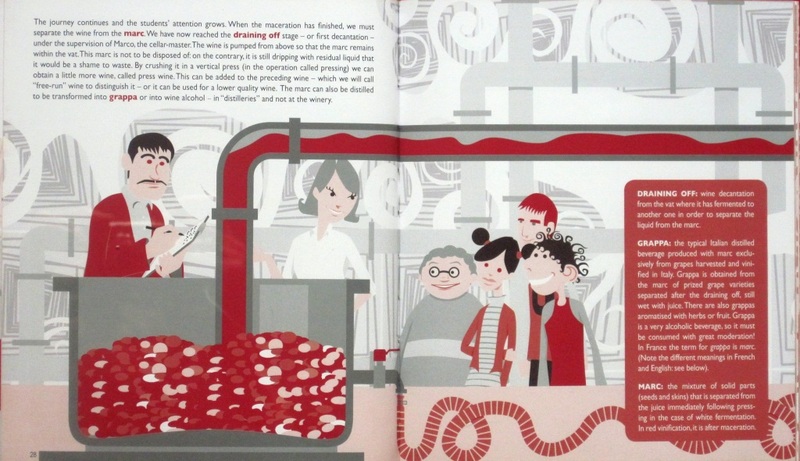 So this present book is the distillation (sorry!) of his many years of experience in Tuscany and with its wines. Belfrage’s introductory material is terrific, covering all the essential points of history, geology, law, grape varieties, viticulture, and vinification clearly and entertainingly. Anyone naïve enough to think that winemaking is a simple and essentially natural process will find this material eye-opening. The bulk of the book is a series of individual entries about producers, the vast majority of them Tuscan red wine makers. Belfrage’s focus is the kingdom of Sangiovese, and white wines and parts of central Italy outside Tuscany really lie just on the border of that realm. Each entry tells you about the ownership and management of the estate and its history, where relevant, and then focuses on the best wines, often with vertical tasting notes. One can argue about what estates should have been included or excluded; I myself, while I share his reverence for Castello di Volpaia and Selvapiana, would certainly have listed Castello di Verrazzano and Villa Cafaggio, for instance. But that’s beside the point: The selection is his, and the reasons for each inclusion are full and persuasive. There is simply a wealth of data here for the active or budding Tuscan wine fan to glean, in haste or at leisure. The book can be read right through to his concluding lists (ten tens, to make “The Finest 100”), or it can be dipped into or used as a reference work. I shouldn’t fail to mention that this is also a very handsome book, with a multitude of fine color photos throughout (Jon Wyand is the photographer). It’s a beautiful production job – good paper, nice size, good feel in the hand, and excellent look to the eye. It’s published by the University of California Press but produced by Fine Wine Editions, the people behind The World of Fine Wine, a roughly quarterly journal, a subscription to which costs about $150 a year. My one reservation about the book – a very small one – rests in the pretentiousness of the journal and the “Finest Wines of” title chosen for its series (yes, there will be more). Hugh Johnson, as editorial advisor, provides the face of this organization, and some of the worst lapses of his normally sound writing seem to set its tone. His one-page introduction to Belfrage’s book manages to segue from wines provoking conversation, to wines speaking to us, to the best wines being silent, “like French cartoons, sans paroles,” to wines as horses (thoroughbreds, to be sure), to the wine world as a plain with peaks and crevasses, and finally back to wines as language working out a new grammar for themselves. As they used to say in The New Yorker, block that metaphor! One final note: excellent as this book is, it is not the first of its kind. Back in 2002, Maurizio Rosso and photographer Chris Meier brought out The Mystique of Barolo, an equally beautiful, informative, and finally very moving memoir of the Barolo community – another book that belongs in every serious wine lover’s collection.